If you are a Professional or Business user, or a user on the Business Preview you can utilize the exclusive features outlined below. Use these extra features to add a subtask, make a task private, and view file previews. You can also add time to a task — ideal for tracking productivity, as well as schedule and host video conferences with HD meetings. Please note the Business Preview accounts have access to these exclusive features for 2 weeks. After this, you will have to upgrade to keep the features. If you opt out of upgrading, your account will be downgraded to the Free plan. Open the task and click on Assign the task. Type the names of the assignees or choose from the suggested assignees. The first assignee is considered the main assignee and is the one who’s name will appear in any task reports. Their profile icon will also appear in the task list. You can click and drag the assignees to change the order. Alternatively, you can add assignees directly from the task list by clicking on the assignee icon to the right of the task. You can also quickly reassign a task this way. Enter the name of the new assignee and click on the arrow to the right. 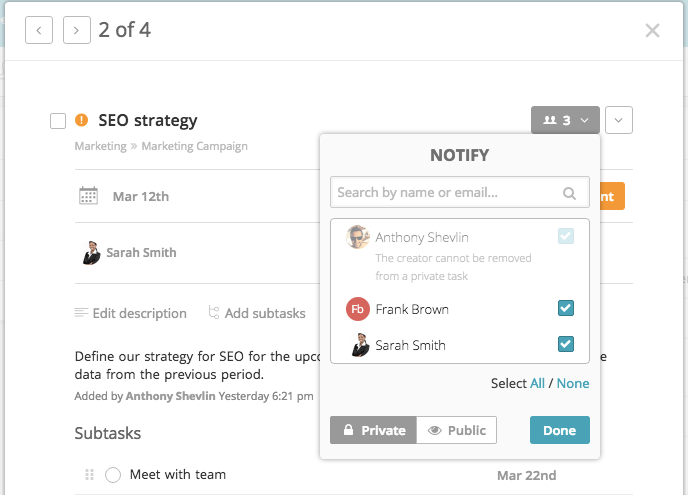 If you are on a Business subscription then you have access to extra subtask enhancements. You can assign a subtask to a colleague as well as setting a due date. Organization admins can enable and disable this feature from within their organization settings. Private tasks are ideal if you are collaborating in a workspace but need to keep a certain task confidential. This is particularly useful if you work with external clients or temporary workers. Not only can you see image previews in task comments, but you can also view documents such as PDFs in a preview mode. The ability to directly preview a document within a task comment, without the need to download it, is a great time saver. You also have the option to see the preview in full screen or to directly download the document. Organization admins can enable and disable time tracking from within their organization settings. Go to the HD Meetings tab on the top of your Redbooth page. Hit the Schedule a Meeting button. Choose the day, starting time, and duration. Click on Repeat if you want it to be a repeated meeting. You can choose how often it will repeat for. Click on the Calendar button to choose the calendar where you want to schedule this event and hit Schedule. Invite members to the meeting via the calendar. Once an HD Meeting is created, any changes or updates must be done through the calendar where you have created it. You can access the meeting via the generated Zoom URL. Only the meeting creator can start the meeting and organization admins can enable or disable this feature. Note: Business Preview customers do not have access to HD Meetings during their free 14-day trial. If you'd like to test out this feature during your trial, please contact our support team using our Request Form.